By the mid-1800s a serious problem had formed in the Gulf of Mexico. Over the centuries, the Mississippi River deposited sediment at the mouth of the river, creating sandbars that eventually prevented ships from sailing in and out of the Mississippi River basin. The Corps of Engineers proposed to Congress that a canal be built between the river and Gulf to bypass the sandbars. However, engineer James Buchanan Eads said that jetties, not canals, were the solution to the problem. If anyone knew the Mississippi River, it was Eads. He first experienced the Mighty Mississippi as a youth in St. Louis while salvaging wrecks on the river. His diving bell invention allowed him to walk along the bottom of the river with an open-ended barrel that had a hose connected to the top, allowing air to be pumped down from a boat; and once at the muddy bottom, all senses relied on touch. He knew the river more intimately than any other engineer, so it seemed odd when Congress rejected his proposal for jetties. After a few years of persuasion, Eads finally made a deal with Congress: he would build the jetties at his own expense, and if they maintained a 30-foot channel, Congress would then pay for the jetties. Eads wanted to build two parallel piers far out into the Gulf, which would narrow the river and increase its current. The concentrated current would then cut its own channel through the sandbar. So in 1875, two lines of pilings were driven to extend the east and west banks of South Pass, and Eads used willow “mattresses” to build up each jetty wall. These were made of trunks of willow trees that were bound together and stacked. The mattresses were held down with stones and topped with concrete. The crevices were eventually filled with sand and mud as the river flowed past them, rendering the jetties impermeable. Eads’s jetties were completed in 1879 and maintained a 30-foot channel, eliminating the silt buildup, and opening up the mouth of the Mississippi once again to ships. New Orleans went from ninth largest port in the US to the second largest, just behind New York. 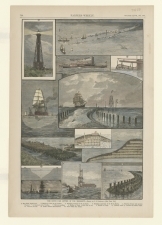 This illustration from Harper’s Weekly, published in 1883, shows several views of Eads jetties at the South Pass. The top and center scenes show ships bustling in and around the jetties. Two scenes on the left show cross section views of the 30-foot channel, and several scenes in the lower portion display various perspectives of the willow mattresses.